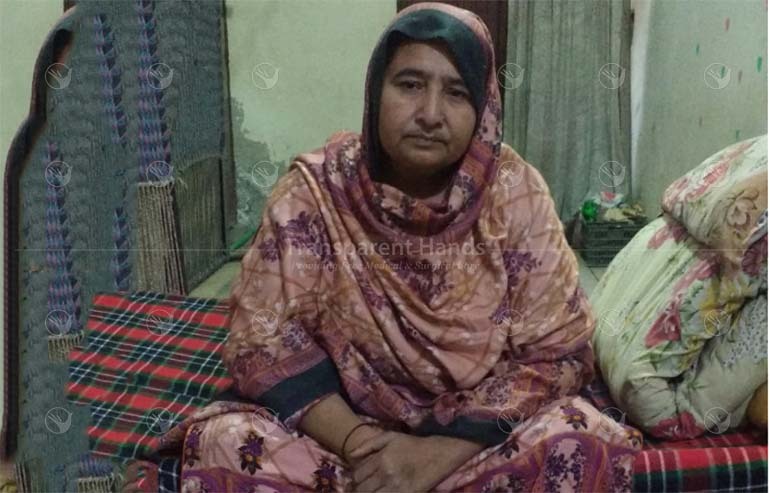 Kausar Parveen is a 52 years old homemaker living with her husband, 2 sons and 2 daughters in their own house in Bahawalnagar. Her husband works at a laundry shop and earns about 12000 PKR per month. One of her sons is working as a delivery boy at a company earning around 13000 PKR per month. In his meager income, he has to support his parents, siblings and also his own family. Kausar was diagnosed with Diabetes and Gallbladder stones almost 5 years ago. Since then, she is suffering from sharp pain in her upper right abdomen and chest, nausea, vomiting and dark urine. She has digestion problems which often causes heartburn and excessive gas which decreases her appetite for food. Her condition has worsened over last few days. She is now suffering from severe pain in her abdomen and frequent fever ranging from low to high body temperature making her body shake with chills. Her disease is affecting her whole family as they cannot see her in so much pain. She has visited many local hospitals for treatment but doctors have advised her surgery for permanent relief. This poor family doesn’t have enough money to get Kausar treated for her disease. Kausar is now scheduled for her Open Cholecystectomy in Akram Medical Complex. Right now, Kausar is looking forward to your help and moral support to pay for her costly surgery. Your donation can bless her with good health and mental serenity!